I received a copy of a micro film of the civil marriage record that was performed by Hugh O'Hara for a decendent of mine and my question is this: how do I find and obtain a copy of this archived record ? Le trois septembre 1814 vû la dispense des trois bans entre WILLIAM Broom, fils majeur de Philip Brown Et de Marie ..(her name left blank) du Royaume d'Angleterre et Marie Anne ARGUIMEAU ou ARDIMOND, veuve de Joseph Lejeuneau, sauvage de Gaspé d'autre part, nous prête missionaire soussigné avons rehabilité le mariage des personnes susdites contracté d'avant Mr. Hugh O'Hara, juge de paix de Gaspé et quant les avons emis au légitime mariage et legit selon la forme ordinaire du Retevil. Un enfant s'appellée Elisabeth, qu'ils nous ont declare être leur fruit mutual, et ce en present de Olivier Morrisse et Mathieu Morris, amis de l'epoux, Thomas Reil et plusiers autres, qui n'ont sue signer. The transcript of the marriage record below is that of the Catholic Church stating that Hugh O'Hara, Justice of the Peace, performed a civil marriage for the said couple prior to 1814. The Catholic Church did not view the marriage legal so the couple remarried. The statement below is that of the baptism of William to become a Catholic on September 3rd, 1814 followed by the marriage to Aboriginal Marie-Anne Arguimeau/Ardimand (sp?) - also on September 3rd, 1814. Also stated in 1813 they had a daughter Elizabeth. How and where can I obtain a copy of the transaction for the civil marriage performed for this couple prior to 1814 by JP Hugh O'Hara ? Your assistance is very much appreciated. September 3rd, 1814, we Missionary & Preast undersigned have performed the Baptismal Ceremony for Guillaume (William) Browns, born the 15th day of March, 1790 from the ligitimate marriage of Philip and Mary Browns from the Kingdom of England. Godfather David Conden - Godmother Francoise Power - that they along with other witnesses were unable to sign. AL Leclerc, Preast. Le trois septembre mil huit cent quatorze par mous prête missionaire soussigné a été reçu l’abjuration de l’heresie(?) et supplées les ceremonies du baptême á Guillaume BROWNS, né le quinze mars 1790 du légitime mariage de Philip BROWNS et de Marie …. (her name not entered) du Royaume d’Angleterre. Parrain: David Conden – Marraine Françoise Power, qui tous ainsi que plusiers témoins n’ont sue signer.. A.L. Leclerc, Ptre. Sept 3rd, 1814 after the publication of three banns of marriage between William Browns, major son of Philip and Marie Browns (her maiden name not provided) from the Kingdom of England and Marie-Anne Ardimond, widow of Joseph ?? (name left blank), living, Aboriginal of Gaspe. A daughter named Elisabeth for which they declared is of their mutual unity, this in the presence of Oliver Morrisse and Mathiew Morris, friend of the groom, Thomas Reil and many others for which were unable to sign. Le trois septembre 1814 vû la dispense des trois bans entre WILLIAM BROWNS, fils majeur de Philip BROWNS Et de Marie ..(her name left blank again) du Royaume d’Angleterre et Marie Anne ARDIMOND, veuve de Joseph ………..(his name was blank also), vivant, sauvage de Gaspé d’autre part, nous prête missionaire soussigné avons rehabilité le mariage des personnes susdites contracté d’avant Mr. Hugh O’Hara, juge de paix de Gaspé et paretense (have no idea what this might be) quant les avons emis au légitime mariage et legit selon la forme ordinaire du Retevil? Un enfant s’appellée Elisabeth, qu’ils nous ont declare être leur fruit mutual, et ce en present de Olivier Morrisse et Mathieu Morris, amis de l’epoux, Thomas Reil et plusiers autres, qui n’ont sou signer. My name is Carole and I have been doing my family tree for 12 months now but I have come to a stand still with my Ann O'Hara. She was born around 1837 in Ardboe, Co Tyrone, and was married to Francis Rocks/Rox; they were my great great grand parents. I have their children born from 1864 in Co Tyrone but no history on them at all after that. The children ended up comming to Stockton in Yorkshire, England. I was told Anne left Francis with the children for someone else and Francis died in a work house. But where Francis Rocks/Rox came from prior to the marriage is a mystery A lovely lady Pat Grimes has been helping me endlessly but cannot find any trace of my Francis Rocks and his family after the births of their children. Wonder if any one can help me please. Francis 7/6/1877 Dromore Co Tyrone. Could any one put a light on this family for me please. My grandmother was Mildred Marie (O'Hara) Schook. Her parents were William Patrick O'Hara and Catherine Bossmeyer. William's father was William Patrick O'Hara and immigrated from Ireland in the 1850's. If anyone is related, please contact me. Would love to exchange information and photos. I knew the O'Haras from Finley St., Belfast. Quinton O'Hara was related to me; my great grandad was James O'Hara. I remember Quinton from Finley St. My mother was named Bella Toland; Grannie Margaret Toland was a blind lady from Ligional Road. Nice to see this site devoted to O'Haras. 539. Thank you for this web site. I have been looking for my biological father, Victor O'Hara. At this point in time, I'm sure he has passed away. He had connections in Bath, Maine. Perhaps through this site my search will reach fruition. Tommy O'Hara was my father's (John) first cousin and was a memeber of the Irish Parliment, the Dail, in the 1950s, 1960s and 1970s. His biography is a follows: Born 20 July 1911, died 5 April 1984; Unscuccesful candidate in the 1943 and 1944 general election as an Independent in Mayo North; Elected in 1951 election, Mayo North constituency, for the "Clann Na Talmhan" party, was re-elected in 1954 but was unsuccessful in 1957 and 1961; Successful in new Constituency of Mayo East as a Candidate for the "Fine Gael" party in 1965 and 1969 but failed in 1973 and retired then from national politics. Please contact me with any information. We want to know more about our O'Hara family. I'm glad this page is here for the O'Hara (O'Hare) family. I'm trying to do my mother's family genealogy. Her mother was Mildred Marie (O'Hare). Her parents were William Patrick O'Hare and Catherine Bossmeyer. They lived in the Louisville, Kentucky area. My great uncle is William Patrick O'Hare, which was priest to the Old St Patrick Church in Louisville. I don't know where in Ireland we are from. I've heard rumor of County Cork. If any body out there has information and would like to exchange it, please e-mail me. I am interested in contacting the person who received results for Kit # N7780 who scored 12 at DYS 393 and 16 at 385B as we have similar scores at those two DYS numbers. Kit # N7780 – John O’Hara, born about 1810 in Drumlish area of County Longford, Ireland. He married Ann Feehily who was also born in the Drumlish area of County Longford, Ireland. Four of their seven children (Bernard, Maria, Kate, and Frank) immigrated to Pennsylvania. I'm trying to research the family tree of John Terence O'Hara who married Marjorie Alice Mara. They had at least one son - John Bernard O'Hara, born around 1915, Lithgow, New South Wales, Australia. 548. Mary O'Hara who immigrated (before 1850) from Ireland to Hartford, CT.
Mary O'Hara married Nicholas Freeman in Hartford, CT in 1850. She had immigrated from Ireland and he from Canada. Mary had a sister Winifred O'Hara who married Cornelius Ryan, later the Chief of Police in Hartford. 549. Mathew O'Hara b 1822 Sligo son of Michael and Bridget nee Gurden came to Halifax England with wife Mary nee McGuinn of Cavan and 3 children during An Gorta Mór. they had 7 more children inc. my ggrandfather James b 1868. I would welcome any information about any of this family. PS. These 2 photos (tif-format) are from the Toronto archives. 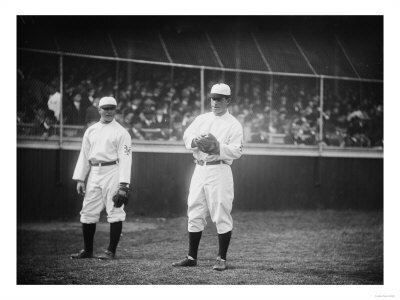 This is of him and Ty Cobb! Looks like an All-star type game but I’m not sure if they had that back then. I forget the year, it was Ty Cobb’s last year that he played I believe.